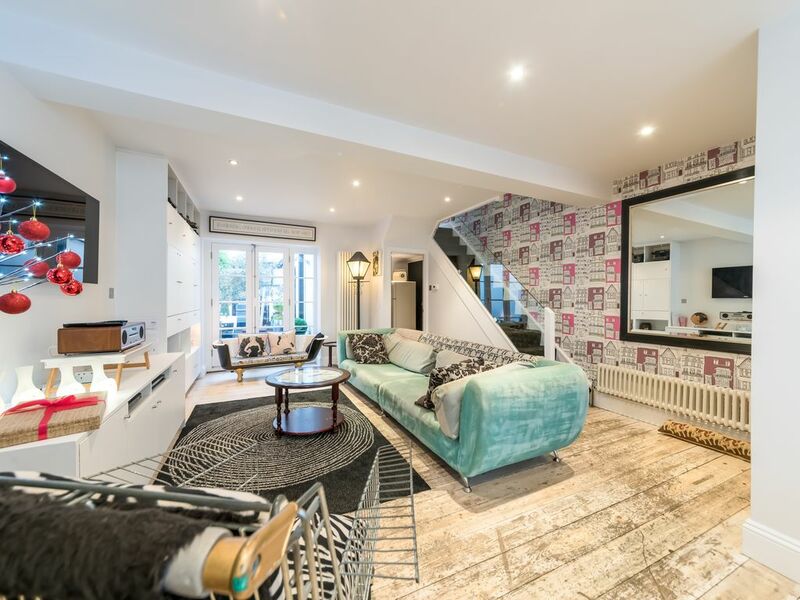 This beautiful house is right in the city centre, but once inside you can enjoy the tranquility and spacious feel of this end-of-terrace Victorian home. While still retaining its original charm, the house has many quirky features including a display of antique typewriters and first-aid cabinets, furniture made from reclaimed scaffold and some stunning artwork. The banisters have been replaced with glass throughout, giving the house a more roomy and modern feel. Decorated in mainly monotones, the stylish interior would appeal to anyone wanting to experience something very British but slightly different. This property is suitable for both families and sharers who want to experience life in Brighton without needing endless taxis. Everything you need is in walking distance including the main shopping mall Churchill Square, the Pier and the beach. We are certain you will be delighted with this wonderful home and look forward to welcoming you! En-suite bathroom to bedroom 1 with basin, WC and whirlpool bath; family bathroom with traditional roll-top bath (with shower over), basin and WC. The dining area is at the back of the kitchen with a skylight over. Seats 8-10. For large groups a buffet style meal is more recommended! A number of board games available for use. Notes on accommodation: Regrettably, we can no longer accept stag do's at the house. Absolutely no parties permitted accept dinner parties. Outside: Private courtyard to rear, accessible both from lounge and kitchen. Please, no BBQ-ing. Utility Room: Washer/dryer, fridge/freezer, vacuum cleaner, iron, ironing board, airer Cleaning / Towels / Linen / Maid service: Towels and bed linen included. For stays of over 9 days, free linen change on a weekly basis. Perfect location and great house! The house is just great, the decor is stunning and the facilities are all perfect. The location is amazing, walking distance to everything. We were a group of 10 girls on a Hen weekend and we couldn't have wished for a better location to explore! The booking information and support from Jo was excellent too! We had a perfect Girly weekend in this beautiful house. The house is decorated with style and taste and situated very close to the Lanes, Beach and fantastic bars. We came by train from Bristol, the station only being 10 mins from the house. Dean Street house had everything to make our weekend stay easy, from hair dryers to tea and coffee in the cupboards! Jo was very helpful and Leah was waiting to greet us at the house when we arrived. We will def be recommending Dean St and visiting Brighton again. Thank you Jo and your team for making our weekend special with fantastic memories made. This house had everything you could want. Beautifully decorated and in a great location. Close to restaurants and shops. The beds were very comfortable and owner accommodating. I would stay here again a and recommend it highly. A really lovely property with real character in a great location to explore everything that Brighton has to offer. 5 mins walk from the beach. Gatwick airport - 30 mins drive - easily accessible by taxi or bus from Pool Valley Brighton. You do not need a car here - you are in walking distance from everything and the cheapest town centre car parks are £25 per 24-hours and 10 mins walk. Visitor permits to park immediately outside the house (not designated) or in the surrounding streets are sometimes available - prebooking advised.